What should I bring on my Study Abroad trip? I am originally from Australia but studied abroad in the US to get both my Bachelors and MBA degrees. I volunteered for 2 years in Europe and almost 1 year in India. My wife also studied abroad at Oxford for 2 months over a Summer to study photography. We believe studying abroad is one of the most beneficial experiences possible for a college student. By studying abroad, students have the opportunity to take in a new culture, see the world and find new passions. No doubt, preparing to go abroad as a student can be challenging (or daunting! ), so we’ve put together a list of what to pack, and more importantly, what NOT to pack before you study abroad. 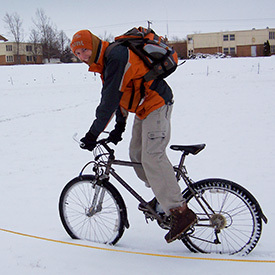 A picture of me riding my bike in the snow for the first time! 1) Universal Adapter – The outlets in your new dormitory or apartment will likely be different from the ones where you are from, not matter the country. This adapter has dual USB ports and built-in fuse protection, and should suit your needs well. 2) Deodorant – Believe it or not, good deodorant can be hard to come by in other countries, especially in Asia. Make sure you bring your own if it’s a product you use, and bring plenty! 3) Apps – While you won’t necessarily pack them, certain apps will help ease your transition abroad and help you get where you need to go out there. Maps.me will let you download maps of particular areas (and whole countries!) for free, so that you can use them offline. Apps like google translate can help you break through that language barrier. Messaging apps like Line and Whatsapp will let you text and call home for free. Do some research and find out what apps have been proven helpful for the country you’re moving to! 4) Snacks from home – Last time I went abroad, my stomach had a hard time adjusting to my new Thai diet. For the first few weeks I desperately wanted something “normal” to snack on instead of diving headfirst into the local cuisine. In case this happens to you, bring with you some granola bars, crackers, or any other simple snacks that can get you through that transition time. 5) International phone plan (or country-specific SIM card) – Ask your carrier about the most economical international phone plan for you. It might be worth it to buy a SIM card in your destination country (super cheap in Asia and Europe), and ditch your old number for a while. 6) Feminine Products – It can be difficult to track down the type/ brand of tampons or pads that you’re used to in the states. For example, in Asia, tampons are only available in big cities. If you bring a big supply with you, that’s one less thing to worry about while you’re abroad. 7) Location-appropriate clothing – Do some research about the country you’re headed to. Check the weather, the dress code (if any) at your in-country school, and definitely find out what kind of clothing is culturally appropriate. It’s always a good idea to keep a multipurpose scarf on hand to cover your shoulders in case you want to wander into a cathedral in Italy, or a Buddhist temple in Sri Lanka. 8) Toiletries (TSA compliant) – It’s almost impossible to find the brands you’re loyal to abroad. If you have a specific SPF moisturizer that you can’t live without (like me! ), or a particular makeup brand that you’re partial to, stock up before leaving. 9) Walking Shoes – There’s a lot of exploring to be done in foreign lands! YOu may also be doing a lot of walking if you don’t have a primary mode of transportation wherever you’ll be staying. Go easy on your feet, and bring some comfortable sneakers. 10) Important documents – Don’t forget the most important items: your passport, visa (if necessary), printed out itinerary and plane tickets. Make copies of all of these, PLUS the backs of your credit and debit cards, in case they get stolen or lost, and you need to call the bank. It’s also a good idea to make copies of your health and travel insurance information to have on hand. You can keep everything organized in an RFID blocking wallet like this one. 11) Packing Cubes – These come in handy when you’re trying to pack your suitcase or even backpack. I use two of them in my big North Face backpack for multiple-day trips for clothing (one for clean clothes, one for dirty). These cubes make it easy to stay organized and pack up super quickly when you’re on the go. 12) Medicine – Navigating a foreign pharmacy is absolutely no fun when you’re running a high fever and are still dealing with a language barrier. Stock up on dayquil, nyquil, advil, anti-diarrheals, cough drops, and anti-nausea meds in case of emergency. You definitely won’t have access to the medicines that you’re accustomed to in certain countries. Make sure you ask your doctor for a 6-month supply of any prescription medications before you leave as well! 13) Physical map – It is infinitely helpful to print-out a map and the name (in the local language) of the location you’ll be staying at on your first night. It takes the stress out of trying to communicate with a cab driver who doesn’t speak your language right when you get off of an eight hour plane ride! 14) Kindle – The last thing you’re going to want to pack in your overly stuffed suitcase or backpack is a heavy book. Download your Lonely Planet guide books (all free with kindle unlimited!) and phrase books on your kindle, and you’re all set. 15) Backpack – You won’t leave home without this one. A solid backpack like this can hold your computer and notebooks when you’re going to class. It will keep you organized and balance out weight on your back, unlike a purse or laptop bag. It’s also great for weekend excursions! 16) Headphones – A good pair of headphones will let you listen to your podcasts while your roommate is sleeping, focus during studying, and entertain you on airplanes. These ones are noise-cancelling and not too expensive. 17) Journal – Ten years from now you’ll want to look back on your time abroad without having to scroll through Facebook or Instagram. Keeping a physical journal can help your mind process all the cool new experiences you’re having, and serve as a first-hand record you can look back on down the road. What you should wear obviously depends on the country you’ll be studying in, and the prominent religion there. Definitely spend some time researching your destination’s cultural norms and weather forecast before deciding what to pack. A quick Google search of “what to wear in Berlin”, for example, should answer any questions you may have. 1) Heavy liquids in bottles – Even though you can pack liquids of almost any size into your checked baggage, weight rules still apply. Don’t weigh yourself down (and pay extra) unless it’s absolutely necessary. Instead, bring travel sizes of your toiletries! 2) Too many clothes/ shoes – You’ll probably want to buy things while you’re there. Bring dual-purpose, neutral-colored clothing that you can mix and match. 3) Culturally inappropriate clothing – You’ll get stared down (and lose respect) for wearing a tank top in countries like Myanmar where it’s unacceptable to show your shoulders. Research, research, research! 4) Books – They’re just too heavy. Invest in a kindle! 5) Non-compatible electronic items – The voltage system in your new country might fry your hair straighteners, blow dryers, etc. It’s better just to buy those things in-country or bring extra adaptors. 6) More than one full suitcase – Remember to leave space so that you can bring home souvenirs! You can work towards your education goals while you see the world and dive head-first into a new culture. What’s not to love? You might also make lifelong friends, pick up a new language, and stand out on grad school applications! 2) Where will I live while I’m abroad? It depends on the city you’ll be studying in. Some foreign academies have on-campus housing (dormitory or apartment style), while other programs will offer to book off-campus housing for you. Check with your specific program as soon as you’re accepted. It will likely be scary at first (navigating a new city to your new classes with new teachers and friends! ), but then awesome and life changing. 4) Can I travel during my program, or have friends or family come visit me? During my time abroad, our school gave us plenty of three day weekends to travel. We also took lots of traveling field trips as a class! It obviously depends on your school, and how strict/ lenient their policies are. As far as I know, friends and family are usually very welcome to visit your campus while abroad! Passport, student visa (if necessary), copies of health insurance, travel insurance, state ID/ drivers license, medical and vaccine history (just in case), and plane tickets. It totally depends on your program. Check with your school and see if your tuition covers your time abroad!